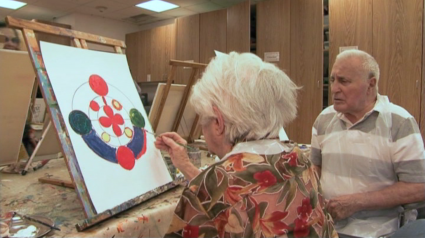 This internationally-filmed DVD documents the use of creative workshops, artistic expression classes, and trips to the museum as an effective therapy for persons with dementia. As it explains what happens in the brain of a person with Alzheimer’s and highlights current research, it shares real examples of persons with Alzheimers’ who “come back to life”, and experience elevated self-esteem and positive mood changes when engaged in art and other creative outlets. Narrated by Olivia de Havilland, the DVD also documents the positive effects of artistic expression of the late actress, Rita Hayworth (as shared by her daughter), and the extended case study of artist Hilda Gorenstein. After being diagnosed with Alzheimer’s, Ms. Gorenstein eventually reclaims her paintbrush and a better quality of life, creating over 300 more paintings. Full of realistic and achievable hope, this DVD heartily encourages the integration of creative arts into the daily activities–and lives– of persons with dementia. A must-see film! Includes 7 Bonus Features (5- to 11-minutes each) that demonstrate the new creative therapies.